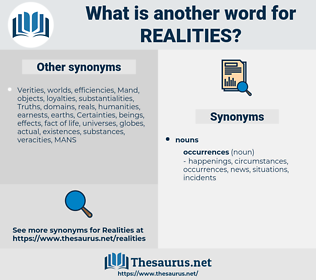 What is another word for Realities? historical, factual, organization, outcomes, issues, chronicle, research, exits, factbox, october, canadian, real, realistic. realistically, circumstances, Particularities, Entities, Certainties, Peculiarities, matters, realms, principles, worlds, relations, requirements, Complexities, Difficulties, perspectives, characteristics, operations, imperatives, terms, specificities, sensitivities, restraints, environment, Environments, relationships, factors, particulars, prerequisites, attributes, Treaties, things, restrictions, Lives, differences, objectives, details, constraints, concepts, implications, reasons, specifics, targets, scenarios, allegations, Achievements, assumptions, limitations, postulates, variables, instances, considerations, Phenomena, Properties, experiences, transactions, conditions, aspects, occurrences, results, ways, stipulations, continents, specifications, arrangements, preconditions, dimensions, actuals, parameters, patterns, Stories, trends, affairs, interests, elements, proceedings, minutes, places, contexts, features, regions, Strains, Exigencies, situations, aims, innovations, challenges, overview, components, merits, developments, incidents, givens, metrics, forces, meanings, actions, settings, views, fact-finding, background, backgrounds, clauses, stresses, parts, acts, burdens, ratios, yields, constants, Goals, endpoints, Areas, findings, deeds, occasions, figures, hostages, lots, concerns, problems, status, options, Businesses, powers, origins, movement, data, provides, demands, pressures, points, events, grounds, Countries, FAITS, women, offences, needs, account, S, issues, realistic. Facts so easy to discover are forced upon the authors of descriptions much as realities are forced upon poets. 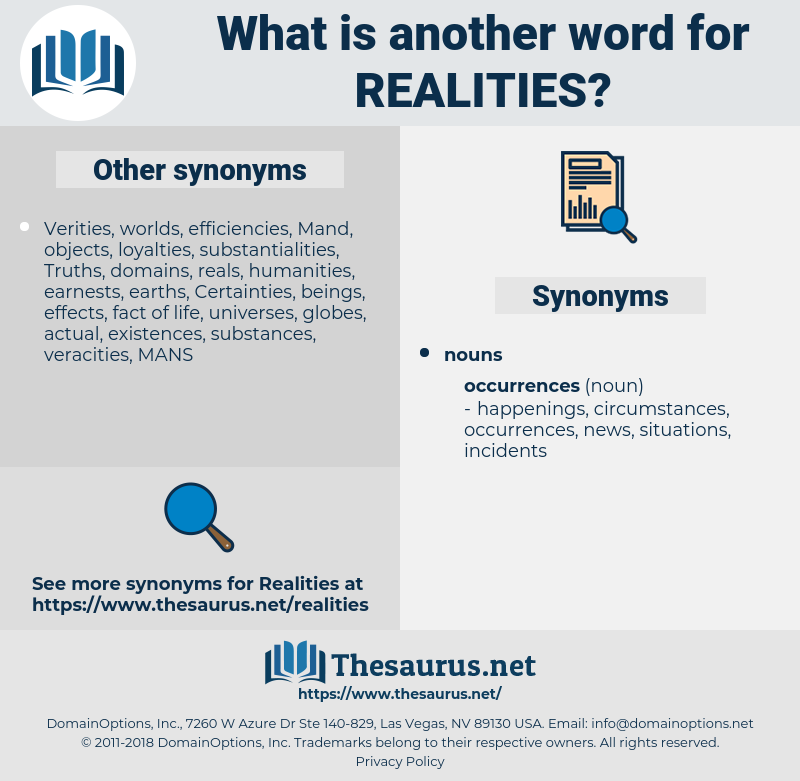 Why must these false " realities" remain?